Mommy Moments: Let's Pretend! | To Be, To Be. Tutubi. This week's Mommy Moments theme is Let's Pretend and the only picture that came to mind was this. It was taken during Danniel's Christmas party last year. We had a lot of fun with that mask, taking turns saying moo, moo! He is in the picture with his classmate Julianna. They were the two cows in the barn where the child Jesus was born. 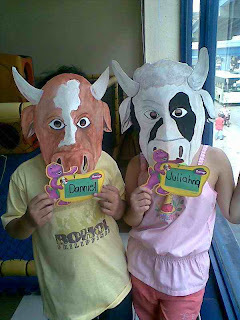 I think Ishi also loved to pretend she was the cow and borrowed that mask from her Kuya, but I can't seem to find the picture! Oh well. he he he, very creative idea!! kids really love to pretend and loves to put the character with their costume. Moooo... the mask did it. Lovely! nice picture! :D heheheh happy mommy moments!